Hi everyone! Today, I’m very excited to be able to participate in the blog tour for Small Town Hearts, hosted by my wonderful friend Lili from Utopia State of Mind! 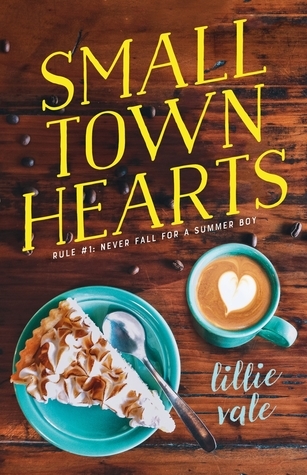 I was super excited when Lili invited me to the blog tour because Small Town Hearts was one of my most anticipated releases. This book hits so many of my buzz words! 1) the main character is bi, and 2) it has a café setting and lots of food related goodness , 3) it’s set in a small beach-side town, etc. And, after finishing the book this weekend, I can safely tell you that it’s just as cute as I expected it to be! Instead of doing a full review of the book, I chose to make playlists instead. I absolutely adore music, and finding the right songs to go with the book is so much fun so… I might’ve gone a little overboard and ended up making 5 different playlists. Oops. I truly hope you’ll enjoy them – and the book – just as much as I did! Babe’s Playlist: Throughout the book Babe, the main character, goes through some changes. She’s really in that transitional period between becoming a ‘real adult’ and being a kid in high school, and she’s also having some problems with her best childhood friends which makes reminisce about the past. Babe is also someone who adores the summer, so for Babe’s playlist I chose to focus most on songs about growing up, finding/losing yourself and summer-y songs. Levi’s Playlist: Levi is the love interest in Small Town Hearts and I loved him so, so much! He’s so soft and cute and just, AH. He’s described as having beautiful blue eyes in the book, so of course I had to add songs about that, as well as songs about falling in love, figuring yourself out and summer. Breakup Playlist: Throughout the book the main character, Babe, experiences break-ups in two different ways: with her ex Elodie, who is back for the summer after dumping Babe a year ago, and a platonic break up with her best childhood friends. All of these songs are wonderfully sad, and I love them very much. Busy’s Playlist: One of my favorite parts of the book was definitely the café Babe works at. It was so lovely to read about her working, making delicious things and her spending time with Lucy, her coworker, and Tom, her boss. I thought it might be a fun idea to make a playlist full of very relaxing songs you could put on in the background of the café. And of course I still had to go with the ‘beach town’ theme by including songs like Brielle (all about a beach town) and Lighthouse (which, well… speaks for itself). Summer Romance Playlist: The main focus of this book is a summer romance, so I couldn’t not make a summer romance playlist! This playlist starts of with a lot of fun, upbeat love songs that remind me a lot of summer, but it ends with a few sadder songs because, with a summer romance, there’s always a chance of having to say goodbye in the end. Lillie Vale, upon discovering she could not be one of Santa’s elves or attend Hogwarts, decided to become a writer to create a little magic of her own. Enjoying the romantic and eerie in equal measure, she’s probably always writing a book where the main characters kiss or kill. Born in Mumbai, she has lived in many U.S. states, and now resides in an Indiana college town where the corn whispers and no one has a clue that she is actually the long-lost caps lock queen. She is the author of Small Town Hearts. This absolutely gorgeous banner was designed by the incredibly talented Mana! Please check out her portfolio here. I’m so proud of all the work you’ve put into this post! I really like the idea of a playlist instead of the generic review, it’s so fresh and original and you’ve chosen some great songs! I love that you did your blog tour post by making creative playlists for the book. I feel like I really got to know what to expect from Small Town Hearts, plus the songs you picked sound perfect for the book’s vibe! Love the songs you chose for the playlist! Especially, Ocean eyes. I love THE MAINE, too! Ah, thank you so much! And I’m so so happy you like The Maine too, they’re so great! Hi there! My name is Laura, and I’m a 21-year-old student from The Netherlands. I love books, making music and TV-shows like Brooklyn 99. This blog is dedicated to my love for books, and you can find my rambles on said books on here. This Is What It Feels Like by Rebecca Barrow is one of the books I'm currently reading, because I want to send it to @slowlyallatonce sometime soon 💞 I'm not that far into it yet, but I've really liked what I did read and I just adore this cover!! I finished this absolutely gorgeous book yesterday, which I read because I owed it to @wordwoonders to read at least one of her favourite books, and I ended up loving it! 💞 So maybe Fadwa does have a good taste in books... Who knows 🤷😂 Anyway, I now want to read every single Stacey Lee book. She's amazing. I've recently read We Carry The Sky by McKayla Robbin and it has easily become one of my favorite poetry collections of all time 💜 It left me feeling emotional but incredibly empowered at the same time, and it was absolutely incredible!